As Israel battles knife-wielding Arab terrorists, Ariel University scientist makes discovery which could save thousands of lives worldwide. An Israeli researcher at Ariel University in Samaria has discovered a revolutionary new method to stop the uncontrolled bleeding common in victims of stabbings - a medical innovation which could save countless lives in Israel and worldwide. Over the past several months Israel has been engulfed by a wave of Arab terrorism, the majority of which have involved stabbings, as well as shootings and car ramming attacks. More than 30 people have been murdered in the attacks and hundreds have been wounded. Many of the victims - which have included the elderly, children and mothers - bled to death after suffering multiple stab wounds and the accompanying rapid blood loss. 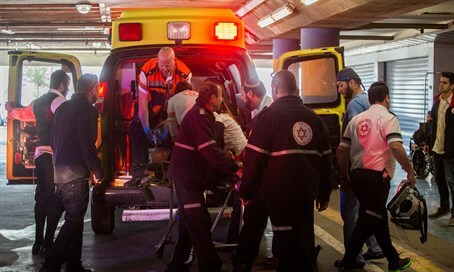 Along with ceaseless incitement, Palestinian terror groups such as Hamas and Fatah have circulated detailed instructions on how to most "effectively" stab or slash a victim to cause maximum damage, and as a result the injuries inflicted to Jewish victims are often extensive and extremely dangerous. Until now the only blood stopping solutions for the type of deep wounds caused by such violent stabbings are either too weak to effectively deal with them, or so strong that they cause deadly blood clots. Even the most able medical first responders often do not have the most effective solutions to save lives when every second counts. But Israeli scientist Moshe Rogosnitzky has discovered that gallium, a biometal currently used to stop bone loss in cancer patients, can, in liquid form (known as gallium nitrate), rapidly halt bleeding from deep wounds without causing blood clots. The use of gallium for stopping bleeding from deep cuts provides additional benefits as well. Extensive research has shown that gallium is a very powerful anti-infective and speeds the healing of injuries caused by deep gashes which are often produced by the knives and other type of weapons used by terrorists. Gallium works by inducing "flocculation" of the clotting protein in blood known as fibrinogen. This results in external clot formation. In stark contrast to other treatments for bleeding wounds, gallium does not induce clotting mechanisms in the blood. This avoids the highest risk of existing technologies that run the risk of causing deadly internal blood clots. According to Rogosnitzky, Gallium has the potential to "dramatically increase the chances of survival by victims of terror or accidents. However, it is vital to get this discovery from the lab to the clinic as quickly as possible. The sooner it gets to the market, the sooner it can be used effectively to save lives." At this stage, gallium has to undergo studies to determine the optimal dose and delivery method prior to filing for marketing authorization by the health authorities. In addition, a comparative efficacy trial with other technologies for stopping bleeding needs to occur. In order to speed up the process for clinical development and availability of gallium, Stop the Bleeding, an online fundraising campaign, has been initiated through We Fund the Cure - a US-based nonprofit. Researchers say they urgently need the funding to move forward to the next stage. "Unfortunately, there seems to be no immediate end in sight to the kind of violent attacks facing Israelis," said Rogosnitzky. "Gallium can provide instantaneous help to victims in Israel. "Our goal is to place gallium in every first aid kit and every ambulance, ensuring that every stabbing victim has an increased chance of survival. In order to move forward quickly we need resources for clinical testing. "Moreover, as blood loss remains the leading cause of death from stabbings and other external injuries, it is our hope that this innovation can help innocent victims of violent crime or accidents throughout the world by significantly reducing mortality rate and providing an effective and safe answer for blood loss from wounds."